Good morning polished world! How are you all doing today? It's the first post of December, therefore it's time to share my #MonthlyManiFavs from the month prior. I meant to have this post up on the 2nd, but I thought today was the 2nd and not yesterday. Fail on me for not looking at a calendar properly. The One With the Re-Creation of the Fall Dot Manicure - Absolutely have loved this one each year that I've done it. It's been about three years in a row and it just never gets old. The One With the Pure Ice Floral Manicure - Guys, do you see that blue? Okay, it's called Teal Appeal, but it looks more blue to me. Regardless, one of my favorite manicures ever. I need to use that polish a lot more. The One With the Pumpkin Mani I Meant to Post a Week Ago - This is the manicure I meant to post a lot earlier in the month but totally forgot about. I did this in the beginning of November to match a cute leaf swing dress I bought for the Harvest Dinner at work. Not only did the dress receive a lot of compliments, but so did this manicure. 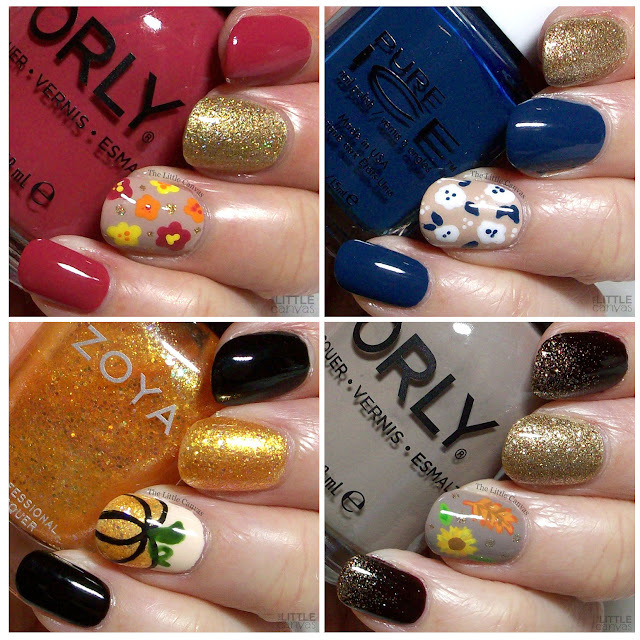 The One With the Fall Floral Manicure That I Forgot to Post for Thanksgiving - Do you notice a theme with the last two posts? LOL . I loved this one though none-the-less. I actually wore it for about 5 days which is abnormal for me. Loved my glitter gradient. Which do you like? Ready for some Christmas/winter manicures? I best get to work!